Give yourself two ways to win: Learn to identify the best spots to semi-bluff with drawing hands. A discussion of semi-bluffing, with an example of a good spot to apply such calculated aggression. 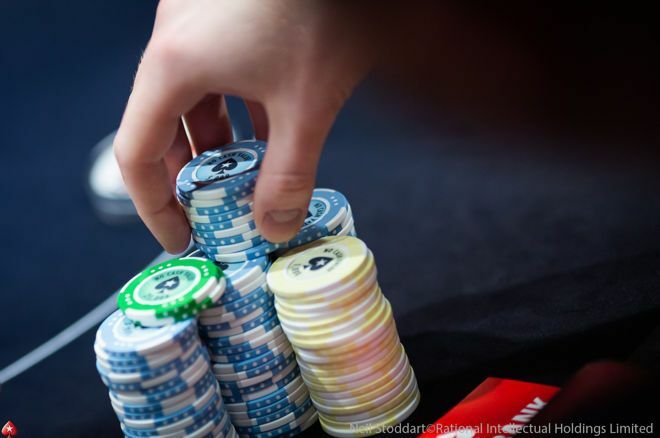 Players making the transition from casual, fun-filled home games to the more serious environment of public poker rooms (including online poker), often demonstrate their new earnestness of purpose by trimming back their play and adopting a very tight form of the game. This is generally a good thing, since competitive poker, especially in the entry-level games like $1/$2 no-limit hold'em, tends to punish players who retain the loose approach of the home game. Even so, once this tight and aggressive style is mastered, these beginning and intermediate players can improve their game further by adding in an element of deception. One of the most powerful forms of deceptive play is generally known as the semi-bluff. A semi-bluff is a bluff with a back-up plan. It is a bluff that can be made on all but the last round of betting, with the added value of having the hand potentially improve to the best hand on the next round of the deal. A semi-bluff is a useful tactic to employ because it has two ways to succeed — either initially by fooling others to fold their superior hand incorrectly, or on a later betting round when the hand improves to the best hand. Here's an example of a semi-bluff that I recently had occasion to use in a moderately soft $1/$2 no-limit hold'em game at a nearby public poker room. It was a late Saturday afternoon. The table was filled with a mixture of a few moderately tight regulars, a bunch of relatively clueless tourists, and a very strong, active regular whom I'd played with a couple of times before. When I was called to the table, there were two seats available — one to the right of the one good player and one to his immediate left. The best seat at the table was the one to his immediate left, because I would almost always get to see his action before I had to act. So I took that seat and bought in for the $300 maximum. I played very few hands during the first 40 minutes, winning one when everyone folded to my preflop raise to $12, and losing one shortly thereafter when my opponent made a large bet on the turn and I folded. I was generally not very active at all and was surely viewed as tight, at least by the five or six opponents who were good enough to notice. About 90 minutes into the game I was dealt on the button. Four players called the big blind, then the solid player in the cutoff raised to $12. I called his raise, as did four others, which meant there was $72 in the pot before the flop arrived. The flop came . With my , I hit the nut flush draw and an inside straight draw. It checked around to the preflop raiser in the cutoff who bet $27. The conventional play for a typically tight beginning and intermediate player with only the drawing hand would probably be to call. But given my position, my image in the minds of my opponents, the possibility that the bettor might have been making a continuation bet without a strong hand, my chances of improvement, and the relatively large size of the pot, it was an excellent opportunity for a semi-bluff. A reraise in this situation might well convince all of my opponents that I had a truly superior hand, thereby convincing them to fold. One of the major mistakes poor and mediocre players make is that they play too many hands. While a bet from late position might typically not convince all players to fold, a reraise in this situation would surely be unusual in this relatively calm game, and would likely fold out all players on drawing or mediocre hands. So, again, the raise had a good chance of working as a bluff. But there was another way I might succeed, even if the bluff failed. With my inside straight draw and flush draw, that added up to 12 outs, 9 of which were to the nut flush. If either the flush or the straight hit, I was a very likely winner, even if the late-position bettor had a strong hand like a premium pair or top pair, top kicker. So I decide to raise him as a semi-bluff. I made it $54 to go — i.e., a minimum raise. I might have raised by more, but I decided the minimum raise would accomplish what I wanted to do without committing me to the pot if someone came over the top with a large reraise or a shove. There was one other consideration about this hand to share. In a way, this betting action might not be considered a bluff or semi-bluff at all. Given the 12 outs that I had, one might view my raise as a value bet, since it had nearly a 50 percent chance of improving to either a straight or a flush. Even so, though my hand was only barely an underdog or maybe even slightly ahead of the bettor's likely range (especially when considering the large bluffing range of a c-bet in this spot), I was representing a much stronger range than the true value of my . Hence I consider my raise to be a bluff, and the move in this spot to be a semi-bluff. Admittedly, this hand would be a cleaner representation of a semi-bluff if I made the bet with some weaker draw — e.g., with , without the three added outs of the inside-straight draw. Just to be clear, a semi-bluff would have made sense with one of those weaker hands as well. Just for the sake of completing the story, as it turned out, everyone folded to my reraise, including the bettor, and I won the $99 pot. The bottom line for all beginning and intermediate players should be simply this: if you haven't done so already, consider adding well-timed semi-bluffs to your generally tight and aggressive game.